Is any of you confused about Material Requirement Planning (MRP) and Manufacturing Resource Planning which well known as MRP II?. Let’s define them a little bit. 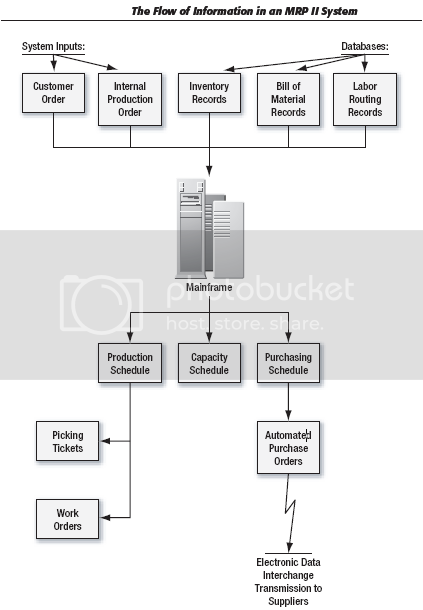 Material Requirements Planning (MRP) and Manufacturing Resource Planning (MRPII) are both incremental information integration business process strategies that are implemented using hardware and modular software applications linked to a central database that stores and delivers business data and information. MRP is concerned primarily with manufacturing materials while MRP II is concerned with the coordination of the entire manufacturing production, including materials, finance, and human relations. The goal of MRP II is to provide consistent data to all players in the manufacturing process as the product moves through the production line. MRP allows for the input of sales forecasts from sales and marketing. These forecasts determine the raw materials demand. MRP and MRP II systems draw on a Master Production Schedule, the break down of specific plans for each product on a line. While MRP allows for the coordination of raw materials purchasing, MRP II facilitates the development of a detailed production schedule that accounts for machine and labor capacity, scheduling the production runs according to the arrival of materials. Both “Material Requirements Planning (MRP)“ and “Manufacturing Resource Planning (MRP II)“ are predecessors of “Enterprise Resource Planning (ERP)“, a business information integration system. The MRP II system was a gradual development of computer systems that were designed to bring the advantages of computerization to the manual manufacturing systems in existence before the 1960s. It began with the creation of databases that tracked inventory. This information had historically been tracked with manually updated index cards or some similar device and was highly prone to error. By shifting to a computer system, companies could make this information available to the purchasing department, where it could be readily consulted when determining how many additional parts to purchase. In addition, the data could now be easily sorted and sifted to see which items were being used the most (and least), which yielded valuable information about what inventory should be kept in stock and what discarded. The purchasing staff now had better information about the amount of “inventory on hand“, but they did not know what quantities of materials were going to be used without going through a series of painfully tedious manual calculations. To alleviate this problem, the MRP II system progressed another step by incorporating a production schedule and a bill of materials for every item listed on it. This was an immense step forward, because now the computer system could multiply the units listed on the production schedule by the component parts for each item, as listed on the bills of material, and arrive at the quantities that had to be purchased in order to meet production requirements. This total amount of purchases was then netted against the available inventory to see if anything in stock could be used, before placing orders for more materials. The lead times for the purchase of each part was also incorporated into the computer system, so that it could determine for the purchasing staff the exact dates on which orders for parts must be placed. This new level of automation was called material requirements planning (MRP), because (as the name implies) it revealed the exact quantities and types of materials needed to run a production operation. One was the use of “labor routings“, which itemized the exact amounts of labor required to complete a product, as well as the identities of the machines on which this work must be done. By multiplying labor routings by the production quantities listed on the production schedule, the computer system could now report on the number of laborers required for a production facility for each day of production and even itemize the skill classifications needed. This capacity planning feature was of particular concern as the attention of companies shifted from simple material planning to ensuring that customers received their shipments on the promised dates. By verifying in advance that customer orders would be completed on time, there was no longer any last-minute scrambling to ship out orders for which there was no available machine time. Another benefit was that customers could be told at or near the time of order placement when their orders could be shipped. Also, if problems of any kind arose, the computer system would notify the production planners, who could reschedule customer orders and tell the customers as far in advance as possible of changes in their ship dates. All of these changes led to a major advance in the levels of customer service that companies could offer. Although this is an extremely abbreviated description of MRP II, it touches on the highlights of how the system functions and what kinds of results are obtained by using it. The underlying software is exceedingly complex and requires lengthy hands-on training and course work to fully understand. However, the basic operating principles are the same, no matter what type of software is used, so expert MRP II practitioners do not have great difficulty in learning new MRP II software packages. The MRP II system is essentially an enormous scheduling tool. It was originally designed to bring structure to the chaos of the manufacturing floor, which it certainly has done in many cases. However, the system was designed to track and plan for existing manufacturing practices, rather than attempt to impose a new methodology for production onto a company. As a result, the same old methods of production still underlie the system—only now everyone knows exactly how those inefficient methods work and can plan around them. The MRP II system still allows suppliers to ship in low-quality goods, requires periodic quality inspection points, allows work-in-process (WIP) to build up, scrap to occur, and machines to have excessively long setup times—all factors that are directly addressed and reduced by the “Just-In-Time (JIT) manufacturing methodology“. Consequently, the MRP II system is much more of a tactical weapon for a company than a strategic one: It will not allow an organization to make great leaps in cost reduction or invested capital, but it can certainly allow it to improve inventory turnover to a significant degree and leads to a much smoother production process. The foundation of the MRP II system is the three databases that feed it information. The most important is the “Bill Of Materials“ database, which consists of a separate record for each product manufactured, with each record itemizing the exact quantities of components, as well as their standard anticipated scrap rates. If there are large subassemblies, then these are usually recorded in a separate record and only referenced in the main record; this practice keeps the bills down to a tolerably short length. The bill of materials database is the driving force behind the material requirements planning portion of the MRP II system, so its accuracy is of the highest importance. An accuracy level of 98% is generally considered to be the bare minimum that will allow the MRP II system to generate accurate information. To attain such a high level, access to the database is closely guarded, and the engineering, purchasing, and production staffs are actively encouraged to warn of problems derived from it. Without a sufficient level of accuracy in this database, employees will experience problems with the information produced by the system, such as incorrect or missing purchasing quantities, that will rapidly lead to production shutdowns that are caused by missing materials. The bill of materials database is also an outstanding tool for the inventory accountant, because it contains accurate information about product components. With that information in hand, it is usually a simple matter to reference the most current costs for each item and derive a product cost for anything in the database, which can then be used for a variety of variance and margin analyses. Another key database is for “Labor Routings“. Each record in this database contains a detailed list of the exact times that each labor position needs to complete a product, and usually includes the required machine time, as well. Accuracy levels in this database are expected to exceed 95%. Some small inaccuracies here will not bring down a production facility, but there will be occasional work stoppages caused by inaccurate labor or capacity calculations that cause bottlenecks to arise. The inventory accountant can use the labor information in these records to determine the standard labor cost of each product, which has applications in the reporting of variances and margins. The information in this database is best used in concert with the bill of materials database, because the two include between them all of the direct costs that are applied to a product. The final database is for inventory. This one records the exact quantity of all items in stock. Better inventory databases also keep exact track of the usage patterns of inventory for several years. Once again, the accuracy level must be extremely high, in the 95% range, or the system will yield inaccurate reports that can lead to production shutdowns. For example, if the inventory database says that there are ten units of a gasket in stock, but there are really only five, then the MRP II system will not place an order for additional gaskets when production is scheduled that calls for ten gaskets. As a result, the production line will use all five remaining gaskets and grind to a halt because the remaining five are not in stock, which causes the purchasing staff to place a rush order for the extra gaskets, to be delivered by expensive overnight mail. The inventory accountant will find that this database is also a gold mine of information, because one can extract from it the last dates when inventory items were used and thereby determine component or product obsolescence. It is also useful for sorting the inventory by total cost (always of concern to auditors), as well as for calculating the amount of inventory on hand (which highlights any excessive ordering practices by the purchasing department). The key factor to consider here is the extremely high degree of accuracy that is required of these databases in order to make the MRP II system create accurate reports. If any of the databases falls short of the highest accuracy standards, then the production department will quickly fall into disarray, missing its shipment deadlines. There will also be a great deal of finger pointing between this department and the purchasing staff, because the blame will appear to lie with the buyers, who are not bringing in the correct parts at the right time or in the correct quantities, but the real culprit is the accuracy of these databases, which are skewing the system’s outputs. Consequently, the greatest possible attention must be paid to creating and maintaining an exceptional level of accuracy in these databases. Because an MRP or MRP II system is essentially a computerized replication of the traditional manufacturing system, there is no real change in the types of inventory transactions used. However, because the level of inventory record accuracy must be so high, there are not normally any physical count adjustments resulting from a formal count of the entire inventory; instead, companies usually adopt ongoing cycle counting in order to achieve higher levels of record accuracy, and make smaller and more frequent adjustment entries based on those counts. On my next post, let’s talk about “ERP – Enterprise Resource Planning“, and “Just In Time (JIT)” inventory system as a comparison of the “Manufacturing Resource Planning (MRP II)“.